You can open Yamb in a browser from anywhere in Yandex.Connect – there are links to all the services next to the logo, at the top-left. To send a message to a specific person, click that person's name. Yamb creates a private chat with this person (or opens one that you have already started). 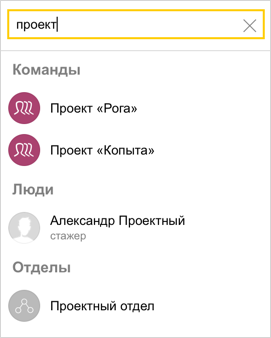 To the right of the chat, you can see the employee profile from Yandex.Connect. To create a chat with a team or department, choose the name in the list, then click Create new chat on the profile that opens. A window opens where you need to enter a name for the chat. You can also add a description of the chat and any additional participants. Add an image. To do this, click and choose an image file on your computer. Send a sticker. To do this, click . Delete a message that you sent within the last 30 minutes. To do this, right-click the message and choose Delete. Click at the top of the chat to view information about settings and participants. Note. The first time you open Yamb in the browser, you need to allow the browser to accept notifications from the site yamb.yandex.ru, so that chat notifications will work. View the list of participants (Participants). Change the name and description for the chat. Don't forget to click to save your changes. If you save the chat with an empty name, it will be named automatically using the names of participants, teams, or departments. Add or remove any chat participant, and assign someone as the chat admin. Some of the notification settings apply to all the chats that you participate in. Click your picture in the upper-right corner and choose Settings. Don't show notifications – Disable all notifications for this account in this browser. Hide notification text – Yamb will notify you of new messages, but it won't show the text of the message in notifications (for example, this means that no one will see the content of your messages on a locked phone). Notify me about every unread message – You will receive email about every new message in Yamb that you didn't read immediately. Get a digest of unread messages per 24-hour period – Yamb will send you a daily email with the number of unread messages that has accumulated over the last 24 hours.